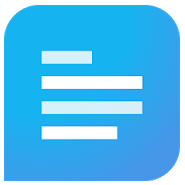 SMS Organizer App: Get Rs 10 on Signup + Rs 10 Per Refer (Amazon Vouchers) – Hello Guyz!! Hope everyone is enjoying our loot deals and Free Paytm Cash Tricks. We regularly post about referral programs which are always conducted by any new website or apps for you. So, you can avail those offers easily. 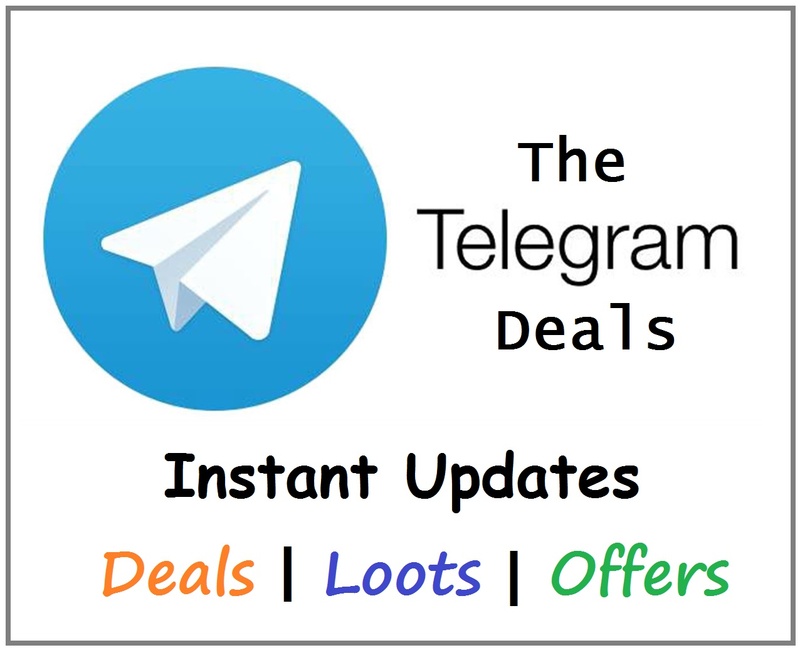 Today we are back with a new Refer & Earn Program of SMS Organizer App in which you can easily avail Free Amazon Vouchers. So, what are you waiting for just read the steps given below to avail this loot. We have described about How to Signup, Refer & Redeem your rewards from SMS Organizer App. Let’s Loot it now!! Update: Signup and Referral Amount Changed to Rs 10. And minimum redemption amount changed to Rs 100 🙁 But still a good loot. So continue. 2. Install and Open it on your Mobile. 3. Now Enter your Mobile no. and Verify it via OTP. 4. Give all the asked permission and SMS Organiser app will start organizing your SMS. 5. That’s it. Rs 10 Signup Bonus will be instantly credited. Start referring friends to earn more balance and redeem it for Free Amazon Gift Vouchers. SMS ORganizer App Referral Program is currently in Beta Version Only which is not yet available on Playstore. But we have got access to the Beta Version apk and you can download to avail Referral Program directly. Refer friends and get Rs 30 per Refer and new users will get Rs 30 as Signup Bonus. You can redeem these earnings for Free Amazon.in Gift Vouchers. Hence Free Shopping or Mobile Recharge Loot. 2. Install and Open. Click on Menu at Top Right Corner from Dashboard and Select Refer & Earn Option. 3. There you will see Rs 10 Signup Bonus in Rewards Section. Copy your Referral Link and Share it with your Friends. 4. Refer more and more friends and you can earn upto Rs 3000. 5. You can track your total referrals and earnings in Rewards Section of Refer & Earn Section. How to Redeem Earnings for Free Amazon Vouchers? Goto Refer & Earn >> Rewards. 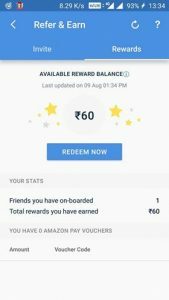 Check your Available Balance and if it is more than Rs 50 then Click on Redeem. 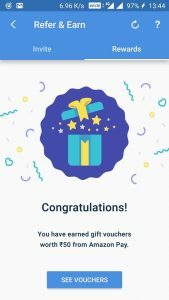 You will get Amazon Gift Vouchers in multiple of Rs 50. So if you redeem Rs 100, you will get 2 vouchers each of Rs 50. You can apply these vouchers at Amazon.in while shopping or recharging. Beta version is not working.